The Gospel of Mark in Latin begins, "Initium evangelii Iesu Christi" ("The beginning of the gospel about Jesus Christ"). 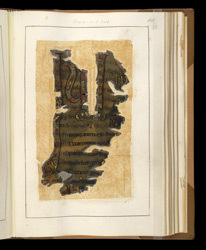 On this page, most of the first word is visible, written in the large decorated letters that are typical of early gospel manuscripts from Britain and Ireland (called 'Insular'). The design of the letter 'N' is also characteristic, with the diagonal element formed of discs of spirals and animal ornament. Within the letter itself, red interlace has animal heads--one of the earliest instances of the use of animal designs to decorate letters in Insular manuscripts. At the top of the page, the red writing originally identified the "gospel according to Mark." The page is so damaged and shrunk by the fire, however, that it is now translucent, the writing on its reverse visible from this side.